Showing 1 - 20 of 100 results. Photograph captioned by BeckerFraserPhotos, "239 Manchester Street". Photograph captioned by BeckerFraserPhotos, "178 Cashel Street, viewed from Manchester Street". 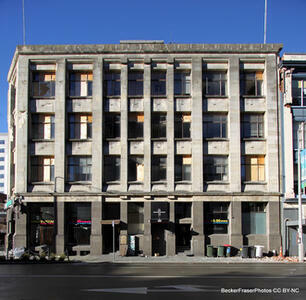 Photograph captioned by BeckerFraserPhotos, "178 Cashel Street (corner of Manchester Street)". 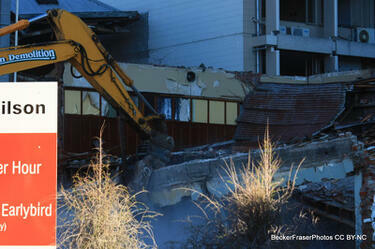 Photograph captioned by BeckerFraserPhotos, "Former Druids Building, 239 Manchester Street". 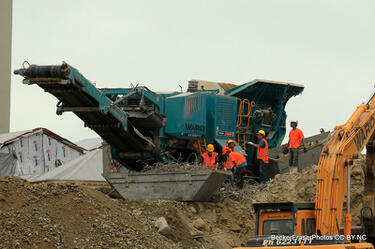 Photograph captioned by BeckerFraserPhotos, "A concrete crusher with workmen salvaging reinforcing steel from the debris, Hereford Street". 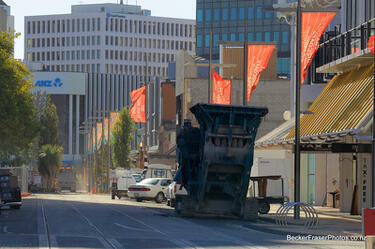 Photograph captioned by BeckerFraserPhotos, "A concrete muncher on High Street looking towards Colombo Street". A photograph of The Concrete Club on Manchester Street. 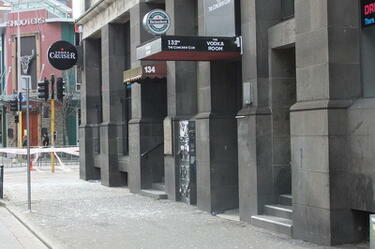 Broken glass litters the footpath in front. 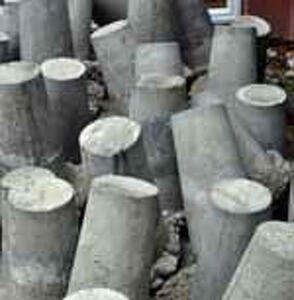 A close-up photograph of the rubble from the demolished Manchester Securities House on the corner of Madras and Gloucester Streets. 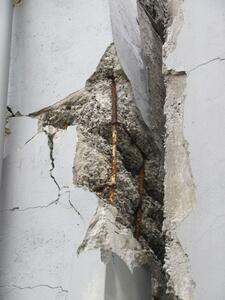 The steel inside the concrete has been exposed. 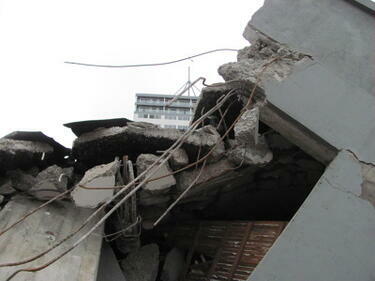 A photograph of a partially-demolished building with steel sticking out of the concrete. 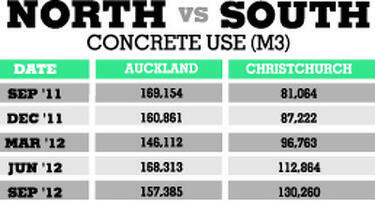 A table comparing concrete use in Auckland and Christchurch. A thumbnail photograph of Whole House Reuse item 109, cropped for the catalogue. This item was salvaged from 19 Admiral Way in New Brighton as part of the Whole House Reuse project. 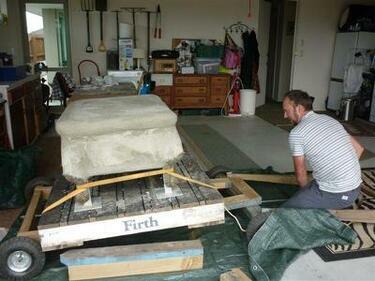 A photograph of Jonathan Hall transferring Crack'd for Christchurch's ottoman artwork onto a wooden base in Helen Campbell's garage. 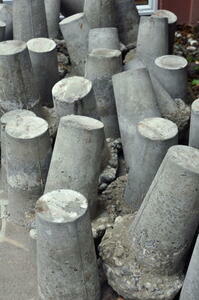 The ottoman has been made out of polystyrene, wood, mesh, and concrete, laid over a steel frame. 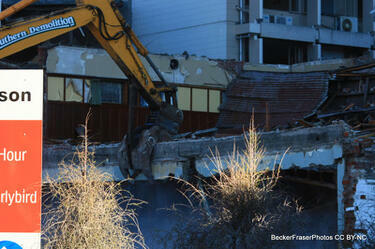 Crack'd for Christchurch comments, "December 2013. 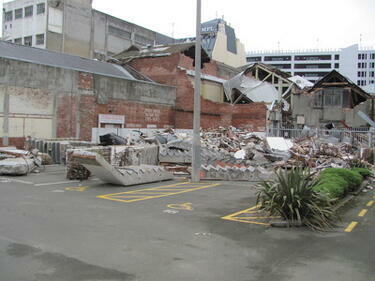 Jonathan delivers the footstool to Helen's garage where it will be mosaicked.."
A photograph of rubble piled up in a car park in the Christchurch central city. Several flights of concrete stairs can be seen. A photograph of Whole House Reuse item 109. This item was salvaged from 19 Admiral Way in New Brighton as part of the Whole House Reuse project. 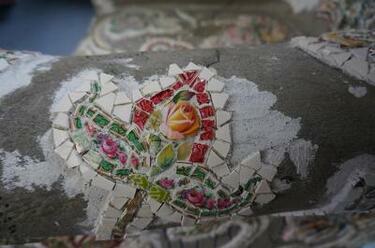 A photograph of a flower mosaic on Crack'd for Christchurch's armchair artwork. 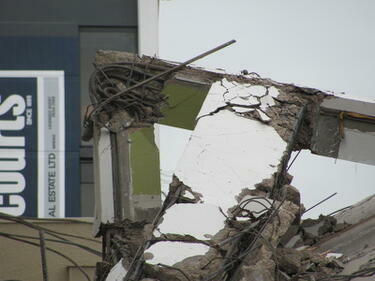 Crack'd for Christchurch comments, "A lovely detail from the chair, with the opus outline but no grout yet." 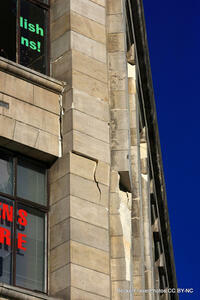 Damage to a column on 145 Hereford Street. 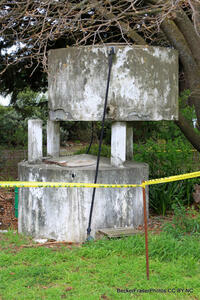 A concrete water tank in Hororata. 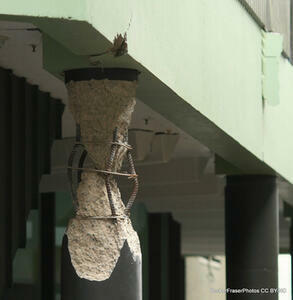 The top half has moved off the pillars and is resting precariously against a tree. 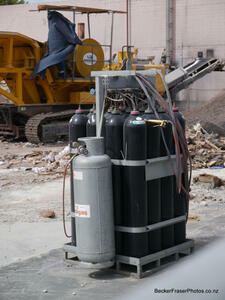 Photograph captioned by BeckerFraserPhotos, "Gas bottles with concrete muncher behind, Armagh Street". Photograph captioned by BeckerFraserPhotos, "Looking from 205 Manchester Street to Radio Newtwork House across concrete rubble from the demolition of SBS House, 180 Manchester Street".